How to crochet. It is really simple. It is simple. Follow these steps. Crochet is the simplest of all needlework. There are no special rules to crochet, but general guidelines only. Crocheting is a very forgiving technique. It encourages you to experiment. Even if you make a mistake, it won't take too much time to correct it. You have an opportunity to create your own beautiful designs, even if you are the beginner. The most important thing - crocheting is a lot of fun. If you have never crocheted and are itching to know how to crochet right away, get a ball of thick, plain yarn to practice. The less fancier the yarn is, the easier it will be to crochet. Get a standard five-inch long (120-130 mm) crochet hook. Its number has to be appropriate thickness for the yarn - look at the yarn label or ask the shopkeeper. It is easier to work if the hook is made of steel and has a plastic or wooden handle. To know the rules of assembling them to make the whole picture. Our stitches are "puzzle pieces". Fortunately, there are only THREE basic stitches in crochet. (I told you, it is simple!) All other stitches are just their variations. Once you know how to crochet these basic stitches, your are ready to "assemble" them and to create all kinds of your own patterns and designs. How to Crochet Basic Crochet Stitches. Important note: Do not pull your yarn too tight. Keep trying, it just takes practice. Step 1. Make a slip knot: cross the tail end of the yarn under the main length of the yarn coming from the ball. .Step 3. Repeat Step 2 until you have the required length of the chain. Step 1. Work a length of chain. For instance, 21 chains. (You do not count the loop on the hook). The number of chains should be equal the number of stitches required plus one. Your 21 chains will make 20 stitches. Step 2. Skip the first chain stitch. 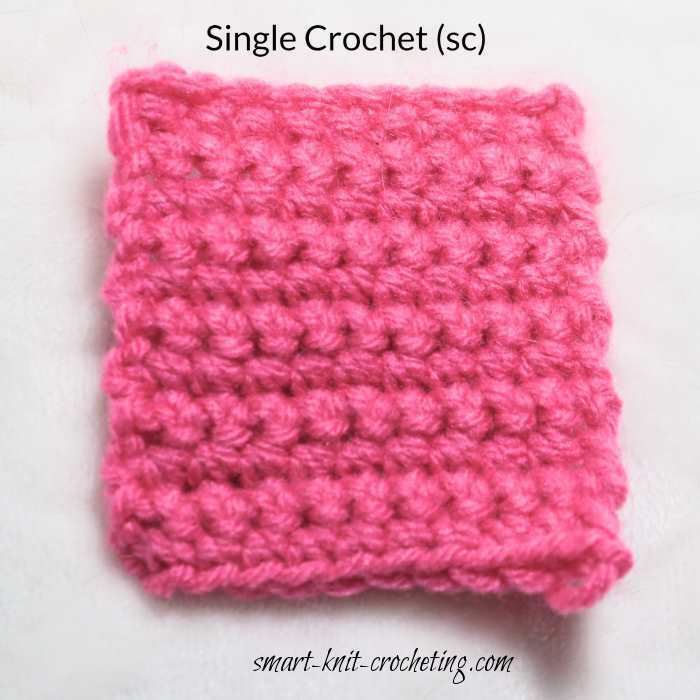 The single crochet (sc) is placed in the 2nd chain from your hook. Draw the yarn through the chain stitch and up onto the hook. There are now 2 loops on the hook. Step 3. Bring the yarn over hook from back to front, and draw it through both loops on the hook. One loop remains on the hook. You have made one single crochet stitch. Repeat Step 3 to the end of the row. You will have 20 single crochet stitches. Step 4. To start the second row, make 1 ch (1 chain) before turning the work. It will be your 1 turning chain. After turning the work, insert the hook into the next stitch. (Your first stitch is the turning chain). Continue working 1 single crochet (1 sc) into each stitch of the previous row. Step 5. Finishing: cut the yarn from the main ball, leaving a piece approximately 6 in in length. Pull this piece through the loop so that a little knot is formed. Step 1. Work a length of chain. For instance, 23 chains. (You do not count the loop on the hook). The number of chains should equal the number of stitches required plus three. Your 23 chains will make 20 stitches. Step 2. Put the yarn over the hook. Skip the first 3 chain stitches. The double crochet (dc) is placed in the fourth chain from your hook. Draw the yarn through the chain stitch and up onto the hook. There are now 3 loops on the hook. Step 3. Yarn over, pull through the first 2 loops. There are 2 loops on the hook now. Yarn over, pull through the remaining two loops. One double crochet is completed. Repeat Step 2 and 3 to the end of the row. Make sure you have exactly 20 double crochet stitches at the end of the row. Step 4. To start the second row, you should chain 3 so all your stitches will be at the same height. These are your 3 turning chains. They count as the first double crochet (dc) for the second row. This is why when you start the second row, you go into the 2nd stitch. Continue placing 1 dc in each stitch to the end. Make sure you have exactly 20 stitches. Note: If you find there is a hole at the start of the rows, chain 2 instead of 3 to get the needed height. You will have to see what works best for you. If you are a visual person, I recommend you to visit Annie's Attic's Stitchguide and view their videos. It will be a wonderful addition to your learning experience. Don't be too excited! Don't try to watch all videos at once. For the beginning you will only have to figure out how to crochet three of the most used stitches. One step at a time. Now you are ready to make magic of a single strand of yarn. Let's "assemble" our basic crochet stitches into something more serious. Our next step is to learn how to crochet patterns in order to form a complete piece of fabric for your own designs. Crochet Patterns in Rows: How to read charts. Crocheting Instructions: How to crochet in rows. Crochet in Rounds: How to read charts. Crochet Instructions: Experiment with loops to create a pattern. Beginner Crochet: How to calculate gauge for patterns. Crocheting Basics How to calculate the correct size of a sweater. Granny Squares: How to crochet a solid Granny Square.